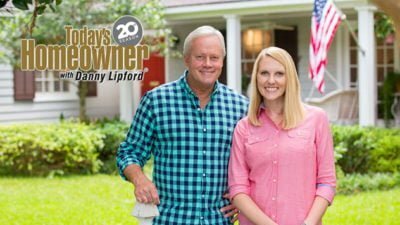 MOBILE, Ala. (Sept. 7, 2017) – Today’s Homeowner with Danny Lipford, the Emmy-nominated, nationally syndicated TV show, will launch its 20th broadcast season this month, taking its place among the most respected, longest-running home improvement shows in the U.S.
Today’s Homeowner will broadcast to more viewers than ever before, with 91% coverage across the country, airing in 207 of the 210 available Nielsen markets. Heading into the 20th season, the show has a 100% renewal rate with syndicated affiliates and will be available in 109 million homes. The Today’s Homeowner journey began with 11-year-old Lipford, who saved his allowance to purchase his first tool, a mail-order jigsaw. He proudly displays it in his workshop today. Lipford first appeared in front of the camera as a remodeling expert on a friend’s local call-in TV show, where he quickly learned he had a knack for helping others to understand and tackle home projects. Eventually, he took over the show and began to build the Today’s Homeowner brand. Today’s Homeowner is the highest-rated syndicated home improvement TV show on the air. The loyal audience of nearly 2 million weekly viewers appreciates the quality, practical, expert advice they get from the show week after week. An independent survey indicates Lipford and his team continue to hit the mark with 97% of viewers rating the information they receive from Today’s Homeowner as excellent. Even with the show’s long-standing success, Lipford and his editorial team continually look for ways to improve content and the viewer experience. Most notably for the 20th season, viewers will see Lipford’s daughter, Chelsea Lipford Wolf, step into the role of full-time co-host alongside her dad. This season, the Today’s Homeowner cast and crew will hit the road to highlight several special home community service projects throughout the country as part of a first-time “20th Season Tour.” Currently, tour episodes are being planned in Tulsa, Okla., and Houston, with more locations in the works for 2018. In addition to the tour, Today’s Homeowner is marking the show’s 20th season with a new, enhanced logo and a special anniversary section on TodaysHomeowner.com. This new landing page will be the hub for all news and special features during season 20. Visitors will have access to exclusive interviews with the cast and crew, a 20-question interview with Danny, photo galleries from the past two decades, contests, media appearances and more. Today’s Homeowner will also utilize its social platforms to share 20th season news and updates throughout the year. Fans can follow and engage with the hashtag #THSeason20. The Today’s Homeowner 20th season kicks off the week of Sept. 18 with its first episode, “Renter’s Renovations.” Though it can be challenging to personalize a rental space, Danny and Chelsea help a trio of roommates in Birmingham, Ala., boost the style and security of their rental home. The beauty is that the fixes are temporary and can move with the roommates when they graduate to first-time homeowners. Allen decided in April to pursue other opportunities, and we wish him the best. Thank you very much for watching the show! Allen quit in April to pursue other opportunities, and we wish him the best. Thank you very much for watching the show. Where is Allen Lyle? I miss seeing him. Having Chelsea on is fine but not having Allen is a huge disappointment. And no explanation? What’s up with that? Congrats and sharing your expertise over the years has really helped me do things I thought I could never do .I grew up on an organic farm with my mom and dad and brother in the 60’s and worked hard along side them ,when organic was not a key word I admire your strong family ties .Hubby and I bought our first first fixer upper after 4 years of apartment living in NJ and after 20+ years of that I retired to VA .Your show taught me how to do things instead of just showing the before and after .We learn by watching and then doing it .I slowly bought power tools with hubby after we bought our first fixer upper and with a 4 year old we managed after 10 years to make it nice and sold it to buy our next fixer upper and 10 years again .Let no one tell you a new house does not need work .I bought a house in VA and dirt back in 2004 .Now we have Splendors Gate .